It appears that the Trump administration has an opportunity to undo the reopening of diplomatic relations with Cuba—just like it wanted to do. Following unexplained “covert sonic device” attacks on envoys from both the US and Canada that were stationed in Havana, the State Department is pulling more than half of its staff out of Cuba, and warning travelers of potential danger. According to The Washington Post, officials are now acknowledging at least 21 Americans stationed at the Cuban embassy have suffered symptoms that include “hearing loss, dizziness, tinnitus, balance problems, visual difficulties, headaches, fatigue, cognitive issues and sleeping difficulties.” (Buzzfeed News puts the number at 25.) The Canadian government has previously confirmed that 10 of its diplomats suffered similar health problems. But the range of symptoms and the fact that the victims have reported different experiences while in Cuba has made it difficult to pin down exactly what is causing harm to these government workers. The decision on Friday to bring staff home is fueled in part by the Cuban government’s inability to explain what is happening and offer assurances that it won’t happen again. Only “emergency personnel” will remain at the embassy and there won’t be enough staff leftover to process any future visas. Experts have been baffled by the reports of hearing damage that may have been caused by “an advanced sonic weapon that operated outside the range of audible sound” but the supposed “laser-like specificity” that would be necessary in such a case appears to be outside of the capabilities of known devices. Victims have reported hearing “loud ringing or a high-pitch chirping similar to crickets or cicadas,” that were isolated in a tiny portion of a room, while others never noticed anything unusual before their symptoms began. On top of that, officials told the Associated Press that it seemed unlikely that all of the reported symptoms could be caused by the same thing. “The physics don’t add up,” one official who was not authorised to speak on the record said. While it’s certainly embarrassing that our State Department and intelligence community is saying that they don’t understand what’s happening, there will be many in the US government who are happy that this is happening. President Trump and Tillerson have both recently expressed their dissatisfaction with President Obama’s decision to renew relations with Cuba in 2014 after 54-year-long trade embargo. Members of Congress who are against any relationship with Cuba, like Marco Rubio, have seized this moment to demand a complete withdrawal over the last few weeks. On Friday, Rubio tweeted that the Cuban embassy in Washington DC should be closed as well. “So Castro regime allows attacks on Americans forcing us to drawdown to keep them safe but he gets to keep about same # of people here,” he asked. If chaos is the motive of whomever’s responsible for the diplomatic attacks in Cuba, it seems safe to say that they’re winning. 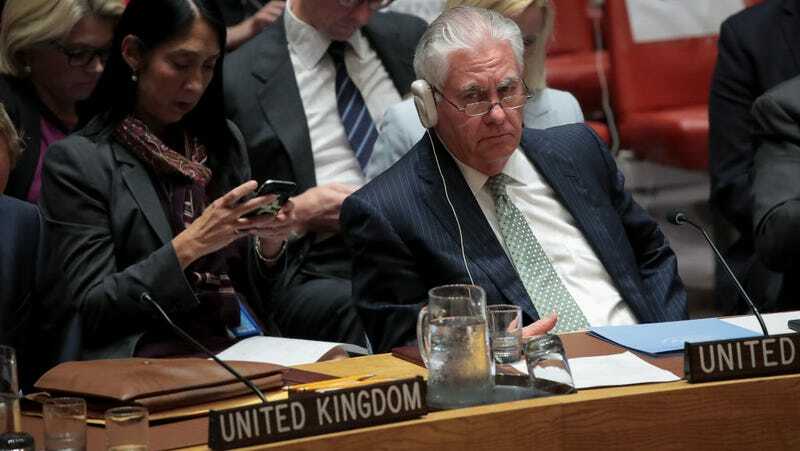 What the Hell Is a &apos;Covert Sonic Device&apos; and Why Is It Deafening Diplomats in Cuba?